"Net Pay" is defined as the thickness of rock that contributes to economically viable production with today's technology, today's prices, and today's costs. Net pay is obviously a moving target since technology, prices, and costs vary almost daily. Tight reservoirs or shaly zones that were bypassed in the past are now prospective pay zones due to new technology and continued demand for hydrocarbons. 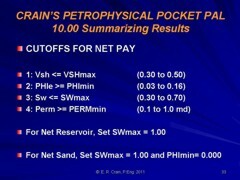 We determine net pay by applying appropriate cutoffs to reservoir properties so that unproductive or uneconomic layers are not counted. This can be done with both log and core data. Routine, or conventional, core analysis data can be summed and averaged to obtain mappable reservoir properties, just like log analysis results. These mappable properties are also used to compare log analysis results to core data. If the mappable properties do not match over the same rock interval, some adjustments must be made to the log analysis. Be sure to depth match the core to the logs first, and take into account macro and micro fractures that the logs cannot see. Laminated reservoirs may cause point by point differences but the average values of log and core properties should be similar. Cumulative reservoir properties, after appropriate cut offs are applied, provide information about the pore volume (PV), hydrocarbon pore volume (HPV), and flow capacity (KH) of a potential pay zone. These values are used to calculate hydrocarbon in place, recoverable reserves, and productivity of wells. The following algorithm is a highly simplified one pass approach, which would need considerable adjustment to run on a real computer. However it is suitable for discussion purposes. It is normal to apply cutoffs to each calculated result to eliminate poor quality or unproductive zones. Cutoffs are usually applied to shale volume, porosity, water saturation, and permeability. The layer is not counted as “pay” if it fails any one of the four cutoffs. These values must be appropriate for the rock sequence. Values in unconventional reservoirs may be more extreme. In reservoir simulation work, the Net Reservoir is also needed. In this case, set SWmax = 1.00. The result of equations 1 to 4 for this case is Hres instead of Hnet. To map Net Sand, set PHImin = 0.0 and SWmax = 1.0. The result of equations 1 to 4 for this case is Hsnd instead of Hnet. Some cutoffs may be set high enough or low enough so as not to be effective. For example, if PERMmin = 0, then no value of Perm could be less than PERMmin, so permeability could not fail to pass a layer. More than one set of cutoffs are normally run and the results compared to find the set that appears to give reasonable results when compared to production profiles in the area. Since porosity is somewhat proportional to shale volume, saturation somewhat proportional to porosity, and permeability somewhat proportional to all three, it is desirable to choose a balanced set of cutoffs. Balanced cutoffs in a hydrocarbon bearing zone usually will fail a layer with more than one cutoff. If only one cutoff fails a layer, the cutoffs may need some adjustment. Sample net pay table with average and cumulative mapable properties based on a typical set of cutoffs appropriate for a low porosity tight gas interval. 1: IF PHIe < PHImim THEN PAYFLAG$ = "TIGHT"
2: OR IF Sw > SWmax THEN PAYFLAG$ = "WET"
3: OR IF Perm < PERMmin THEN PAYFLAG$ = "LOWPERM"
4: OR IF Vsh > VSHmax THEN PAYFLAG$ = "SHALY"
5: OTHERWISE PAYFLAG$ = "PAYZONE"
6: IF PHIdc >= PHInc + TOLER THEN PRODFLAG$ = "GAS"
6: IF PHIdc < PHInc + TOLER THEN PRODFLAG$ = "OIL"
7: IF PHIe * Sw > PHIxSWmax THEN PRODFLAG$ = "H2O"
Sonic neutron crossover can also be used to test for "GAS" flag. The only real way to determine cutoffs is to run a flowmeter in the well over the reservoir. If an interval flows oil or gas, it is above cutoffs - if it doesn't flow oil or gas, it's below cutoffs. If it flows water with oil or gas, it has failed the water saturation cutoff. This procedure requires that you perforate poor quality rock to see if it will flow. Some managers will resist this added expense as they "know" what produces and what doesn't. Close spaced DST's can also be used in open or cased hole to simulate a flowmeter profile. You can mimic this in the lab with flow tests in core plugs using reservoir fluids under simulated formation pressure and temperature. However, hardly anyone actually does either flowmeter or core flow analysis because it is expensive and often means completing or coring poor quality rock to find out how low the cutoffs can be set. The pragmatic approach is much more widely used. 1. Plot core porosity vs logarithm of core permeability. Fit a semi-log line through the data points (exclude fractured plugs). For gas use a perm cutoff of 0.1 to 1.0 md, for oil use 1.0 to 5.0 md. Find the equivalent porosity on this graph corresponding to the selected perm cutoff. This is your porosity cutoff. 2. Plot porosity vs water saturation in the oil or gas leg above the transition zone. This can be log analysis data or values from capillary pressure curves. Fit a hyperbolic line through the data. Enter with porosity cutoff and find corresponding SW. This is the SW cutoff. 3. In shaly sands, plot porosity vs shale volume. Enter graph with porosity cutoff and pick corresponding shale volume. This is Vsh cutoff. This is called a coordinated cutoff set. Reservoir engineers sometimes plot cumulative porosity or permeability or both (sort data into ascending order first). They then place the cutoff at the 5 or 10% accumulation. This is exceedingly arbitrary but was a widespread method. It was only vaguely useful if the core contained no poor quality rock or if there was no spread in the rock properties. In some situations, the continuity of the pay zone is important to exonomic decisions. Tar sand mining, steam assisted gravity drainage, fire floods, and some water flood scenarios need continuous reservoir quality rock to be effective. Thin non-pay intervals are OK, but thick ones are not. The levels that pass these four tests can be checked for continuity against two thickness criteria. One is the minimum zone thickness needed to be considered as a pay zone. The second is a maximum non-pay interval allowed in the overall pay zone before the zone is broken into more than one pay zone. These two criteria are called the acceptance thickness and rejection thickness respectively. To find the beginning of a possible pay zone, search from the top of the computed interval for the first data set with a "pass" in its cutoff field. Then find the first deeper level with a "fail" in its cutoff field. The depths of these two points define the top (ZONETOP) and bottom (ZONEBOTTOM) of a zone. This interval thickness is tested against the acceptance criteria. The depth of the next pay zone top is then found and the interval between pay zones tested against the rejection criteria. 2: OR IF PAYFLAG$ ="GAS"
3: OR IF PAYFLAG$ ="H2O"
4: THEN CUTOFF$ = "PASS"
5: OTHERWISE CUTOFF$ = "FAIL"
6: IF CUTOFF$ = "PASS"
7: AND TOPFLAG$ = "START"
9: AND TOPFLAG$ = "TOPFOUND"
10: AND BOTTOMFLAG$ = "START"
11: IF CUTOFF$ = "FAIL"
12: AND BOTTOMFLAG$ = "START"
14: AND BOTTOMFLAG$ = "BOTTOMFOUND"
15: AND TOPFLAG$ = "START"
16: AND NEXTTOPFLAG$ = "START"
17: IF CUTOFF$ = "PASS"
18: AND NEXTTOPFLAG$ = "START"
20: AND NEXTTOPFLAG$ = "TOPFOUND"
25: OTHERWISE PAYFLAG$ = "BARREN"
31: OTHERWISE PAYFLAG$ = "BARREN"
Repeat these steps until the bottom of the computation interval is reached. At this time each level computed will have two flags set - one to indicate whether it passed cutoffs (CUTOFF$) and whether the layer is considered part of a pay zone (PAYFLAG$), even if it failed its cutoffs. To find net pay thickness, count the number of levels with the pay flag equal to "pay" and multiply by the depth increment between the data points. Assume data as shown below. Note that data listing is in percent, not fractional, units. Then net pay extends from 2054.1 to include 2063.1. 2. If SWcut is lowered to 50.0, then net pay covers 2054.1 to 2059.5 and 2061.9 to 2062.2 in two zones. 3. If HREJECT = 3 m, then these two pay zones combine to form one zone because the rejected interval is less than 3.0 m.
4. If HACCEPT = 3.0 m, then the second zone is not pay because it is not thick enough. Rejected intervals are included in the zone for Case 3 and contribute to net pay thickness.